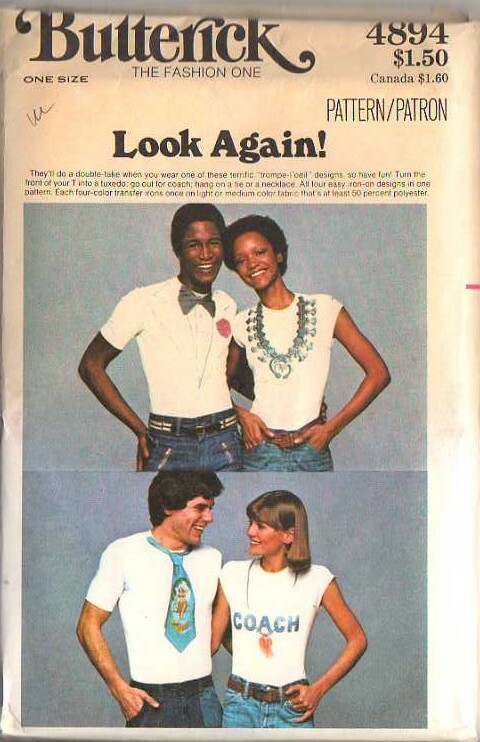 70s Hippie Era, Retro Fun Indie Crafts Patterns - They'll do a double take when you wear one of these terrifice 'trompe l'oeil' designs, so have fun! Turn the front of your T into a tuxedo, go out for coach, hand on a tie or a necklace. Iron on four color transfers. FULL COLOR PERMANENT TRANSFERS Fabrics:For the BEST results use 100% polyester or nylon fabrics or their combinations. Results on 50% polyester and 50% natural fabrics will be FAIR. Any natural fabric, such as cotton, wool, silk or their derivatives: rayon or acetate will produce POOR results and transfer image may wash out. THE MORE POLYESTER OR NYLON IN THE FABRIC THE MORE BRILLIANT AND CLEAR THE TRANSFER IMAGE WILL APPEAR. CONDITION: Pattern is uncut & unused, discontinued New Old Stock! All pieces appear to be accounted for, intact and have been neatly refolded with the original instructions.